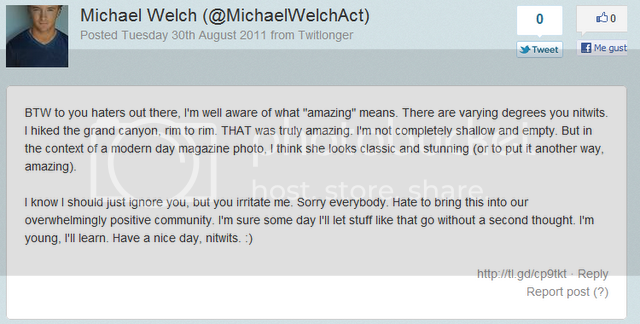 RobStenation: Michael Welch Tweets about Kristen's W Mag. Paris Seen with Kristen's W.
Michael Welch Tweets about Kristen's W Mag. Paris Seen with Kristen's W.
Michael Welch tweets about our Kristen being in W Magazine... and addresses haters. "BTW, have you all seen Kristen on the cover of W this month? Holy Moses, she looks AMAZING! Incredible picture." "BTW to you haters out there, I'm well aware of what "amazing" means. There are varying degrees you nitwits. I hiked the grand canyon, rim to rim. THAT was truly amazing. I'm not completely shallow and empty. But in the context of a modern day magazine photo, I think she looks classic and stunning (or to put it another way, amazing). I know I should just ignore you, but you irritate me. Sorry everybody. Hate to bring this into our overwhelmingly positive community. I'm sure some day I'll let stuff like that go without a second thought. I'm young, I'll learn. Have a nice day, nitwits. :)"
Not the first time that Michael was on the defensive, he also did so in 2010 backing up both Rob and Kristen against different media speculations. On the lighter side, Paris Hilton was papped carrying Kristen's W Magazine. Cool. Thanks to AdeleStew for the HQ Pic.